Teaching your family dog to “refind” or return to handler after they find a person or object is another way your dog can indicate or alert you of the find. Area search dogs and air scenting dogs who work off leash to cover large areas of land like in an avalanche are usually taught upon finding a person or evidence to return to their handler and bring the handler back to the person or location. 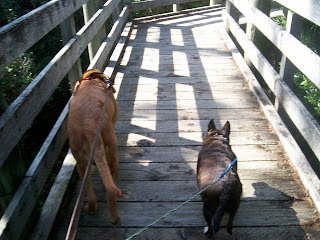 Dogs who work on a leash have the handler with them; therefore there is no need to go back to the handler. I teach my Bloodhounds to take me back to my truck or home on command because I seldom know where I am once we trail a person several miles in the woods. Back to the truck ! I teach my dogs by simply telling them “let’s go home” or “back to the truck” each time we start back after we are finished with the training session or real search. Then if I am ever lost, I know, I can ask my dog to take me home or to the truck. Family Disaster Dogs on and off a leash can use this skill to bring people and items back to you if you are unable to move or wish to stay with another person. If you are sheltering in place then you can send your dog out to get an item and bring the item back to you. Let it be known that some breeds of dogs will not “backtrack” or return the way they came. Bloodhounds and other hounds especially do not like to go backwards on the same scent trail. Some breeds and bloodlines are bred not to backtrack and when a dog is trailing and tracking we do not want them to backtrack because this defeats the purpose. 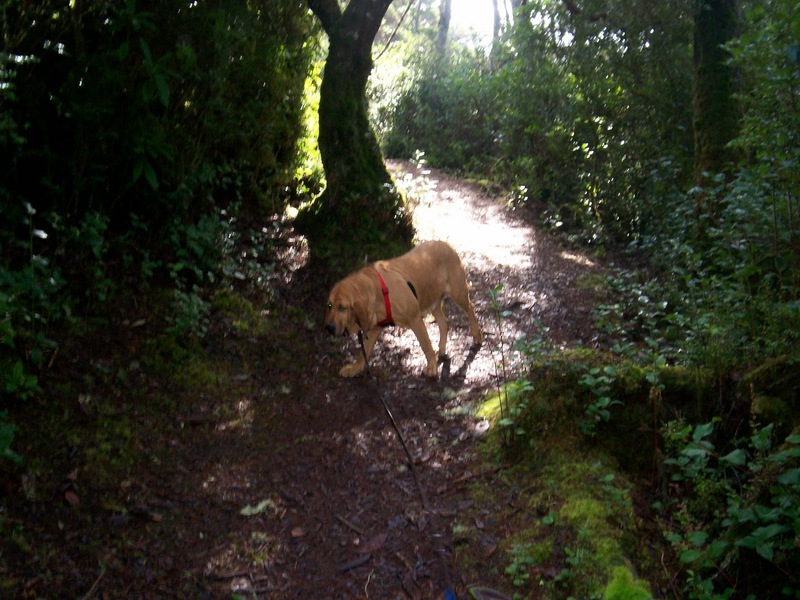 Another reason backtracking is not encouraged or bred for is that if a dog encounters a place where the quarry or person walked in circles the dog will get lost in the scent overlapping on its own trail. A good hound will hit a place where a person or animal walked in circles and go right in one side of the circle then out the side the person exited while another dog will smell and smell, going in circles themselves trying to figure this puzzle out. Give time they might figure it out or sit there and look at you to figure it out. With backtracking in mind, if your family dog refuses to go backwards on a course to return to you or the person then you may have a very smart dog on your hands that you have to out smart by taking a different route back. Just move a little bit to one side of the original trail the dog traveled on, maybe 30-50ft so your dog gets a chance to use a different path to reach you. We do not want to teach them to backtrack either so moving off of the course is a good idea and changing the locations will help too. Refind and return to handler can be taught at the same time as all the lessons here at Family Disaster Dogs. This skill is incorporated into your other lessons as you practice with your dog you will add the instructions below into the end of the lessons. Always praise your dog for a job well done. To teach your dog to return to you after finding a person you will send your dog to search or find them as detailed in the other lessons. When your dog arrives at the person the dog is rewarded by that person then told by the person to “go back” or use your own name, like “Go to Joe”. You stay a distance away when your dog finds the person and you call your dog back to you after the other person praises your dog. You praise your dog when they come back to you then ask your dog to find the person again, sending the dog back to “refind” the person. When the dog refinds the person the second time, if you are not there by then, the person should send your dog back to you again until you reach them as a team. Repeating this will help your dog learn they are bringing you to what they have found a person. And, they are not only running between two people. Dog’s like to have a purpose for what they are doing otherwise it is play. You should adjust the distance between you and your dog according to your own dog’s way of working. Some dogs run along at a fast pace while others work slowly. Some find the person long before you get there no matter how hard you try to keep up while others might seem to take their time smelling every bush. Each dog is different. The trick is to give your dog space to find the person and return to you. So don’t follow to close at first then later add more distance to the space your dog has to cover to return to you. As you give the dog more distance to cover they will learn to find you as you get out of sight and to bring you back to the person as both of you come back together. In time and with practice your dog can be sent out to search over a large area of land to scout and pin point locations for you then come back and take you to those locations. Adding refind or return to handler to area searching and evidence or building searches saves you valuable time because your dog alone can cover much more ground that we can. When your dog is searching every item they find that holds the scent of the person they are looking for will be found too. This is evidence of where the person has been. When your dog takes you to objects you must always believe the item belonged to the person you seek because your dog is showing you a clue. Trust your dog. In the next lesson we’ll be discussing sending your dog to retrieve first aid kits, food and other emergency supplies by name that you might need if you are trapped or unable to leave people who are injured. After over 30 years working with dogs, I really do believe any dog, any age, any breed can learn to do some of the lessons here to help their families and loved ones be safe and survive in an emergency situation. The smallest or oldest dog can learn to bark or nudge you in an emergency to alert you to danger, every dog is able to help in some way just as they would as a group or pack. Never underestimate your dog. Please pass these lessons on so others may benefit. Click for Family Disaster Dogs on Amazon. Get all the lessons, dog bug-out bag list, Pet CPR and more ! 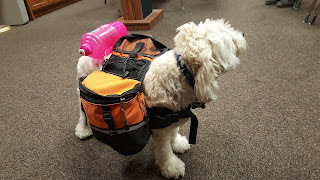 Once your dog is playing fetch and retrieving it is time to add-on “go-get survival gear” for you in case you can’t reach the gear and other objects by name that you and your family will need. Service dogs retrieve items for their owners daily, they open doors and find wallets,keys and cell phones. Your family dog can do the same if you teach them the name of the item you want. During the retrieval lessons you will be teaching your dog to associate the word with the gear and the name of objects. Start slowly, one item at a time. Start with small items and work up to larger heavier objects. As an example, let’s use a small first aid kit, show this to your dog and tell your dog the name, like, ”Medkit” . Keep the name or command simple and short. First Aid Kit is to long of word. 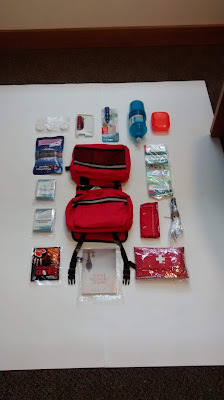 A soft carry case first aid kit like the one pictured is a good example. Hide the “Medkit” with your dog watching then ask your already trained scenting dog to "find" the “Medkit” by name. Or toss the item as you say “Medkit”, for your dog to fetch and bring back to you. 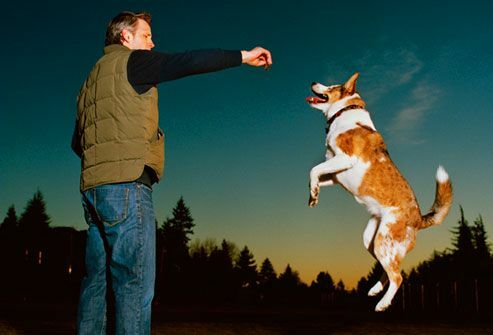 To teach your dog to bring you gear and items by name once your dog is retrieving, you are basically going to be teaching the dog the names of the objects so you can send them to retrieve for you. Teaching your dog the name of the objects you might need during an emergency or disaster situation can be done during all of the lessons by simply including the name of the object while you’re training. Some of these Family Disaster Dog lessons are retraining your dog to do things they were taught not to do as puppies and teaching them the name of an object they were previously told to leave alone will take longer then had they never been conditioned to leave the object alone. For this reason, always say your dog’s name and following the name use the same word to name each object or word you want your dog to learn to retrieve for you. If you incorporate the name of the object into the training you will be surprised how quickly your dog can learn our words. 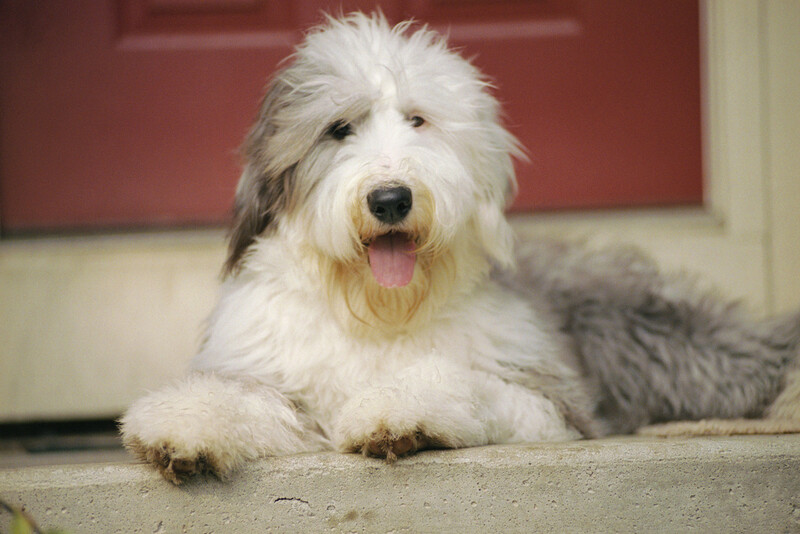 We often forget to speak to our dogs or give them a chance to show us they know our words. 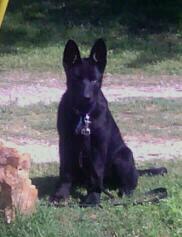 Always allow your dog time to show you and read your dog like they have to read us in order to work as our teammate. Which items will you need your dog to get for you? Which words do they have to learn? Large dogs can learn to get your go-bag or bug-out bag and their own dog backpack and take these items to the front door or a location of your choice. Here's a picture of what I put together for a basic dog Bug-out bag to help people get started. Personal items, dog and human food are not included. If you would like me to put one together for you email me via the contact page above. Large and medium size dogs can move a lot of things into a vehicle or to another location in the event that we have to evacuate or move locations. Small dog’s can learn to grab small items, like first aid kits, flashlight, maps, your purse or wallet. In an emergency I would consider my wallet very safe if my dog was holding onto it. With practice your dog can learn to find the car keys and meet you at the car while you are getting the family to the car to evacuate. It would be great to see your dog waiting with the keys in the car. Do teach these skills, all you do is plan the lesson on paper, then set up the session where you run through what you want your dog to do, step by step you will show your dog the way you planned them to take, and the items you want them to pick up, and where to go and then ask your dog to lay-stay or sit-stay or teach your dog to return to you. Repeat the steps again and again on different days using the same commands for your dog to "go get gear" and "load car", take your dog to each gear item say "get gear" then "load car" , take your dog to the car where they deposit the item and you repeat the steps with the next item. Praise and love at the end for a job well done. Encourage them and help until they get the idea. Assign each object you want your dog to know a name, always use the same word. Always use your dog’s name first or they might think you are talking to somebody else. Repeat your lesson plane several times over a couple of week’s time without any changes and your dog will learn what you want. Only after the first job or mission is mastered do you introduce another plan or job for your dog to learn and do the same as before by repeating the exercise until your dog has mastered the lesson over a couple of weeks. At other times when your dog is with the object, always get in the habit of speaking with your dog by saying the objects name. If you are packing the baby's bag- say “ baby's bag”; when you pick up your wallet or handbag show your dog and say "wallet", if you are getting into the car- say “car”, walking to the back yard-say “yard”, when getting your dog's water- say ”water” because someday you may need your dog to find water for you. Just like a human child with time and practice, animals, can learn our language too. Get a free preview and please leave a review ! Spread the word to help others know what to do in emergencies.